Ever had to coordinate when would be a good time for a group of patrons to meet at the library? Or, perhaps, you need to make a meeting for the department heads or your colleagues? Or, maybe, you have volunteers interested in working on a project and you want them to come when the most people are available? 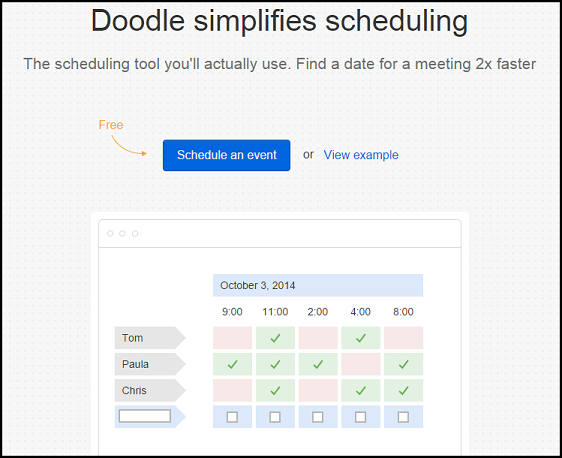 Check out Doodle, http://doodle.com/, a free online program which collects and shows everyone's availability. You make a list of the days and times and email everyone a URL. They click on the link, add their name to the list, and then let you know the times they are free, busy, and can come, if need be. They do not need to register, so it is painless and simple to use. You can easily see all the results on one chart and can find what works best for everyone. In seconds! 15 Viral Content Ideas for Your Library's FB Page!